BMG LABTECH, the microplate reader company, will showcase its newest technology at ELRIG 2012 in Manchester, UK on September 5 and 6. Visit BMG LABTECH booth Q11 and Q12 to learn how innovative technology greatly enhances microplate applications. As will be highlighted in several posters and at a lunchtime seminar, BMG LABTECH will detail how its innovative microplate reader technologies can improve your scientific research. When designing its newest microplate readers, BMG LABTECH analysed the market to determine what features are missing in a microplate reader that will enhance life science applications. Two such advancements that greatly improve assays are ultra-fast, full spectrum analysis for absorbance assays and direct optic bottom reading for cell-based assays. At ELRIG 2012, BMG LABTECH will present how to use the SoPRano label-free technology in a simple, spectrometer-based absorbance reader to obtain protein-protein binding kinetics such as the association (ka) and dissociation (kd) rates, as well as EC/IC50 and KD values. With the SoPRano assay and BMG LABTECH’s ultra-fast, full spectrum analysis with a CCD-spectrometer, label-free applications are now possible without purchasing expensive, dedicated SPR equipment. In addition, BMG LABTECH will show how cell-based assays greatly benefit from its innovative direct optic bottom reading design. When automating cell-based assays to an HTS or HCS platform, loss of sensitivity is a concern. 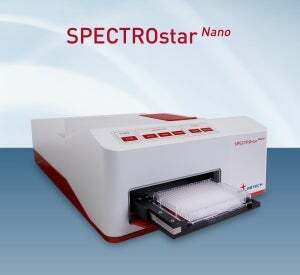 Learn how direct optic bottom reading on the PHERAstar FS achieves signal-to-blank ratios in fluorescent cell-based assays like GFP, mCherry and mOrange that are more than 300% higher than other microplate readers. With this level of sensitivity, obtaining higher throughput from an existing FACS or a confocal microscope assay is now possible. Please visit BMG LABTECH at Booth Q11 & Q12 at ERLIG 2012 to learn more about the future of microplate reader technology today.